RED LION CONTROLS, a global expert in communication, monitoring and control for industrial automation and networking, has announced that its flagship Crimson 3.0 software now offers communication support for more than 300 industrial protocols. RITTAL reports it has launched a new EC Speed Control, compatible with larger models from the TopTherm EC fan-and-filter unit range (uninstalled air throughputs between 180 m³/h and 900 m³/h). 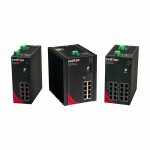 RED LION CONTROLS, experts in communication, monitoring and control for industrial automation and networking, has announced the addition of the N-Tronseries Gigabit 1000-POE+ Power over Ethernet Plus (PoE+) injectors to its industrial networking solutions portfolio. Red Lion’s new injectors are said to deliver both power and data over a single Ethernet cable to any PoE+ or PoE-enabled device, eliminating the need for additional power cables. RED LION CONTROLS, expert in communication, monitoring and control for industrial automation and networking, has announced the expansion of its N-Tron series NT24k managed Gigabit Ethernet industrial switch platform with the addition of compact DIN-rail mountable switches.